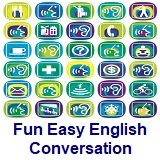 ﻿ Fun Easy English - new classroom free online classes english language lessons speaking listening writing reading april 22. 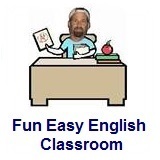 Today in the Fun Easy English classroom you are going to learn "getcha" an American English reduction. She is going to getcha another drink. He is planning to getcha a new car. He already decided to getcha more money. She is going to getcha drunk again. I really want to getcha into this club. 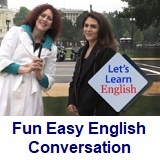 This American English reduction is used often in television, movies, and everyday conversations among native English speakers. 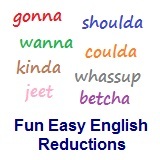 Reductions, such as getcha are not real words in English. Debbie: I give up! I simply can’t learn French! Helen: Why do you say that? I think you’re making a lot of progress. Debbie: No, I’m not. I try and try and I still can’t speak it very well. 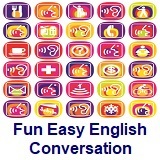 Helen: Learning any language takes a lot of effort. But don’t give up. 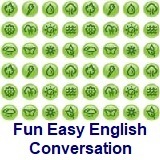 Why don’t we practice those dialogs together? Debbie: Good idea. That just might help. Meaning is stop trying; abandon effort. Meaning is absolutely, completely, clearly. Meaning is I try again and again. Other examples of repetition of the verb to express continuous or repeated activity: I read and read, and I still can’t understand it. He writes and writes, but he never produces a worthwhile composition. The children play and play that game and never seem to get tired of it. Meaning is that’s a good idea. Meaning is that might, in fact, be a helpful thing to do.